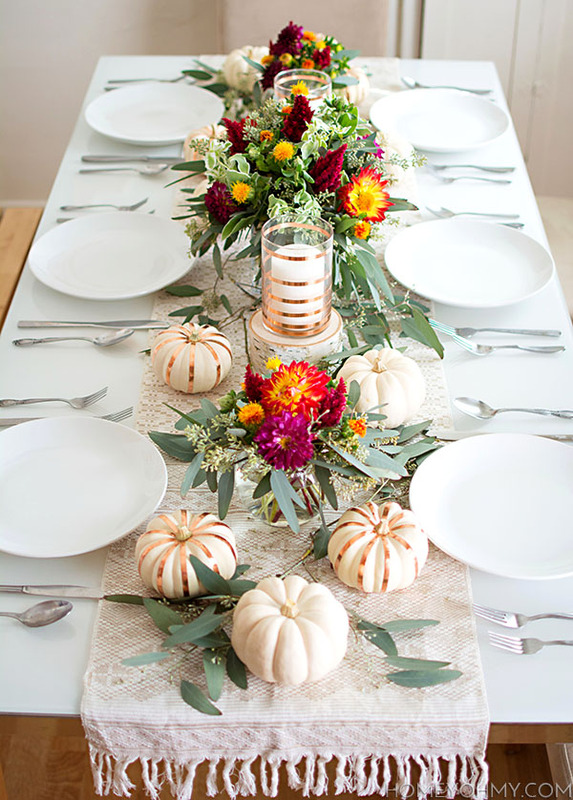 The Thanksgiving season is upon us, which is the perfect reason to start decorating fall tables. 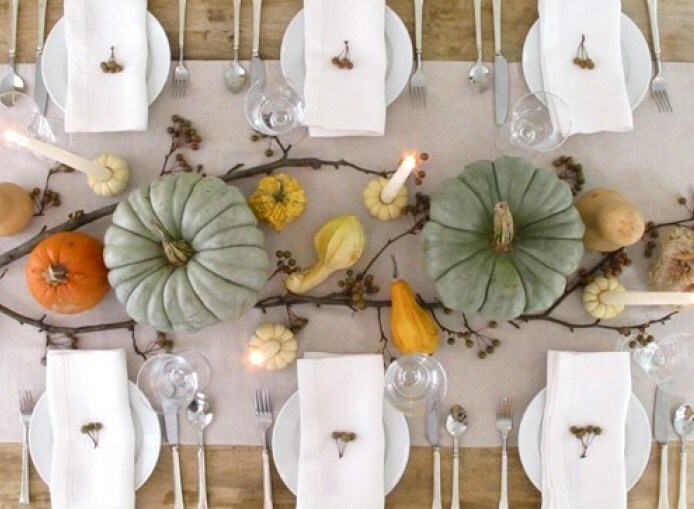 Here are the beautiful tablescapes that are inspiring us for Thanksgiving 2015, along with some tips and ideas for recreating these looks in your own cozy home. The table above inspires us with jewel tones; the rich blues and purples in this setting make us swoon. Find out more at Martha Stewart. 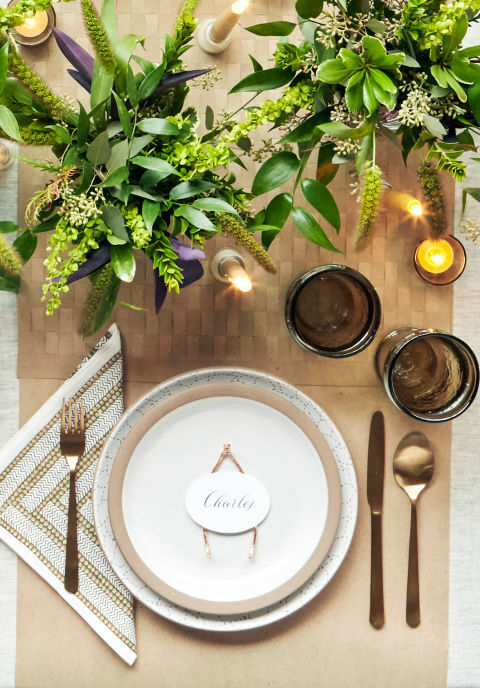 Add a dash of whimsy with these rose gold wishbones placecards. Get the DIY at Country Living. 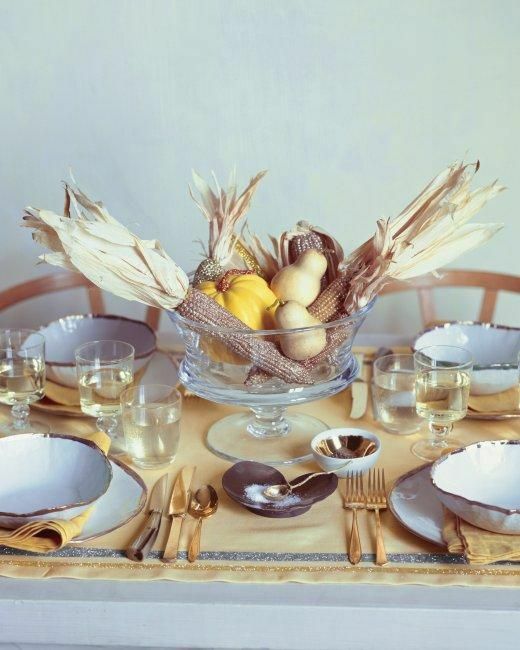 Modernize your Thanksgiving table with this monochrome version of the traditional cornucopia. 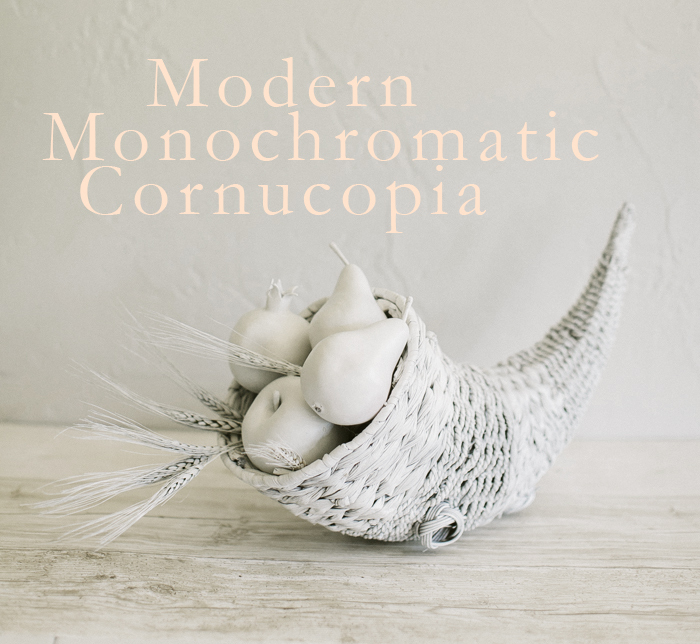 Get the tutorial here: Modern Monochrome Cornucopia. 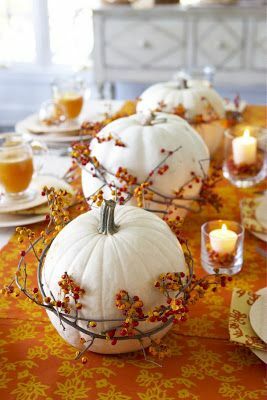 Paint a couple of mini pumpkins the color of your dinner plates to make them stand out. Find out more at Decorating Your Small Space. 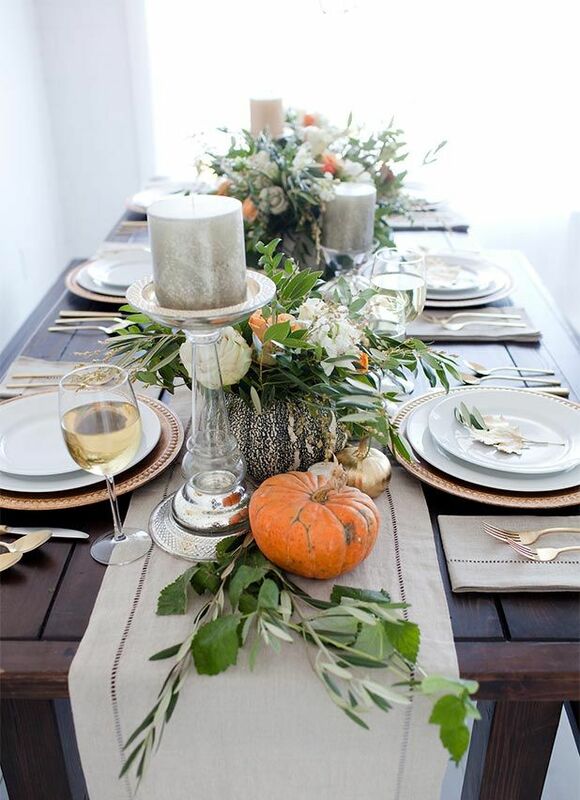 These feather napkins and natural elements make for a serene Thanksgiving tablescape at Home Stories A to Z.
Wrap some autumn branches around white pumpkins to make a simple and cute centerpiece. Find out more at Halloweencesky. 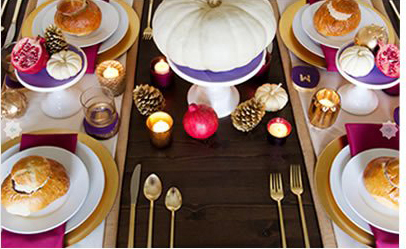 Use golden-hues for your table décor this year to add a little bling. 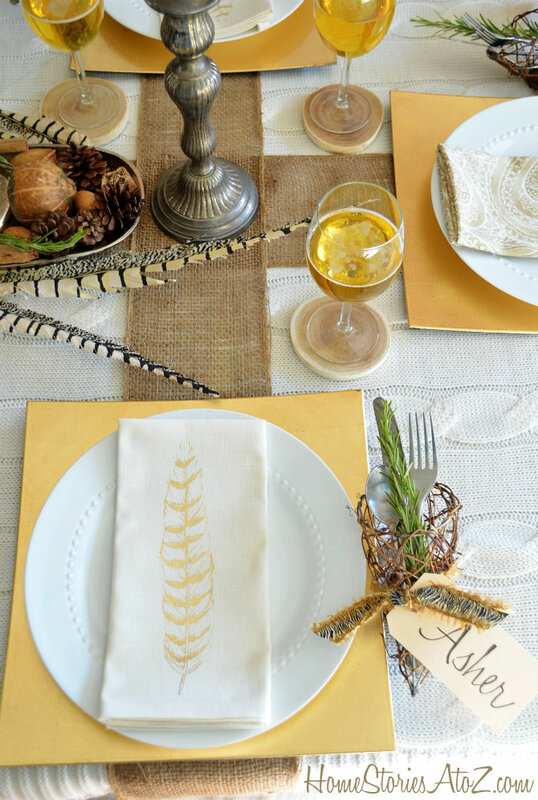 Tape gold glitter tape to the tablecloth to make it sparkle. Find out more at Martha Stewart. 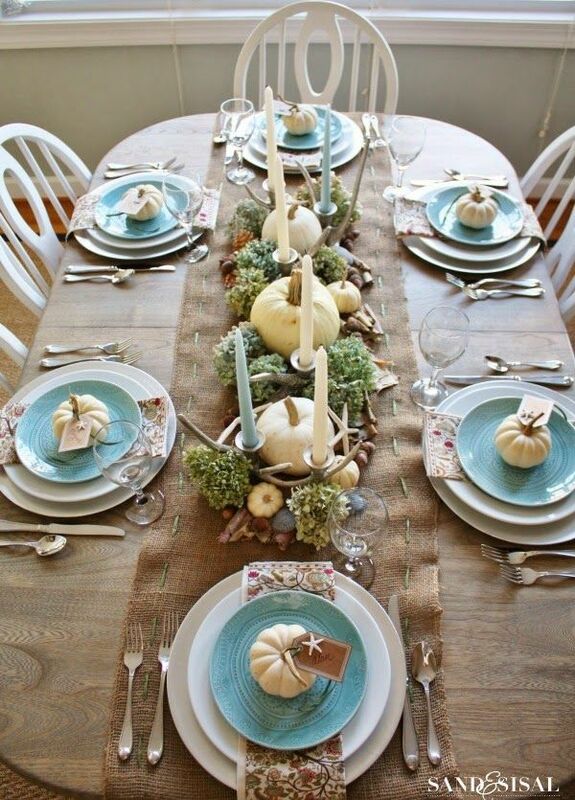 Perfect for turkey day by the beach, learn more about this coastal Thanksgiving tablescape at Sand and Sisal. 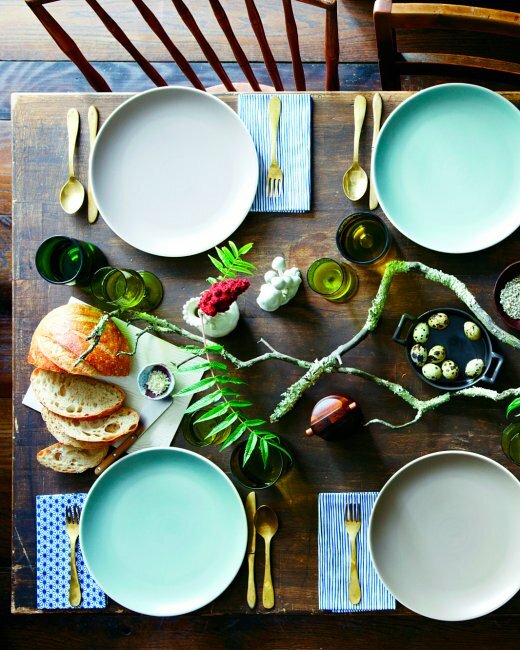 Change up your dinner by using printed plates and cobalt blue napkins. Find out more at Anthropologie. 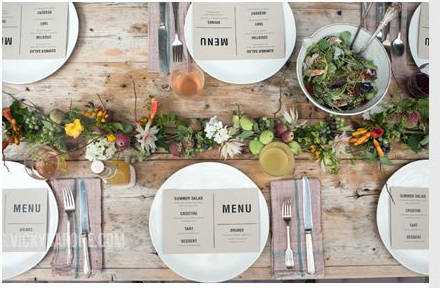 Head outside and gather some twigs and garden goodness to create a natural table runner. Find out more at Vicky Barone. 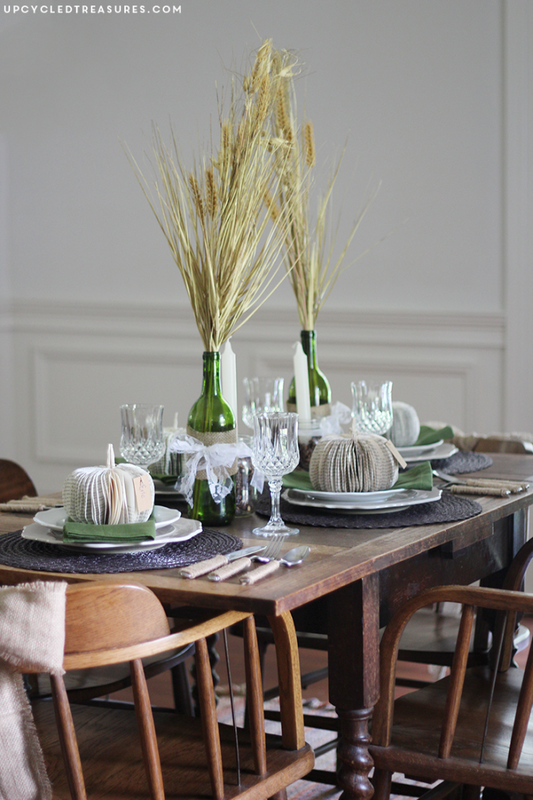 Learn how to simply arrange a rustic Thanksgiving centerpiece at Pottery Barn Kids. 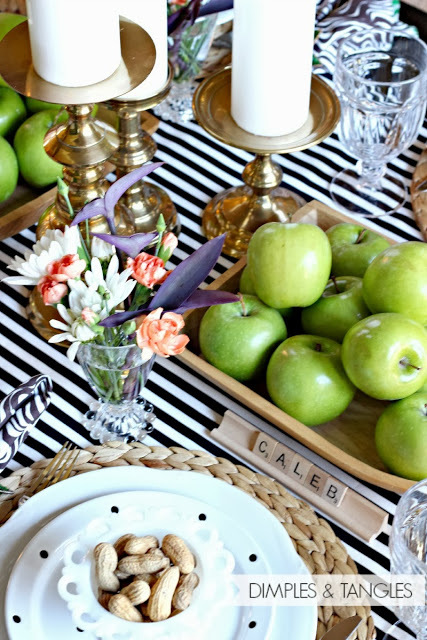 These striped pumpkins add a little jazz and class to this Thanksgiving table. Find out more at Homey Oh My. 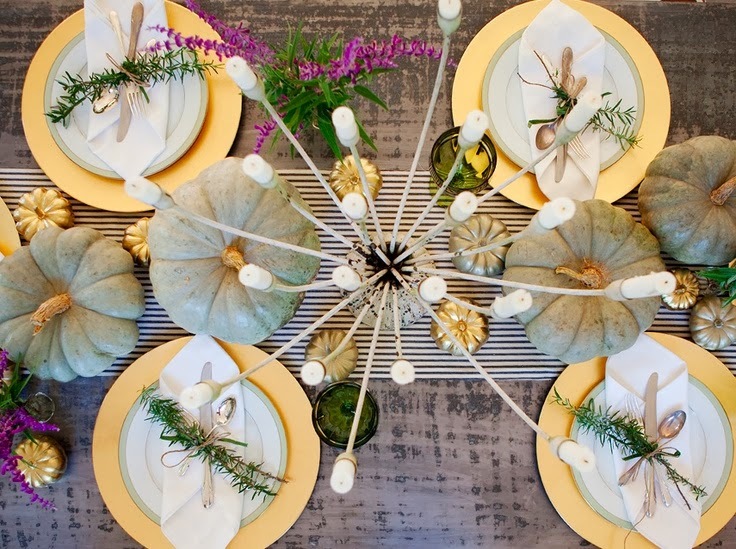 The unexpected striped tablecloth adds a dash of personality to this Thanksgiving tablescape at Dimples and Tangles. 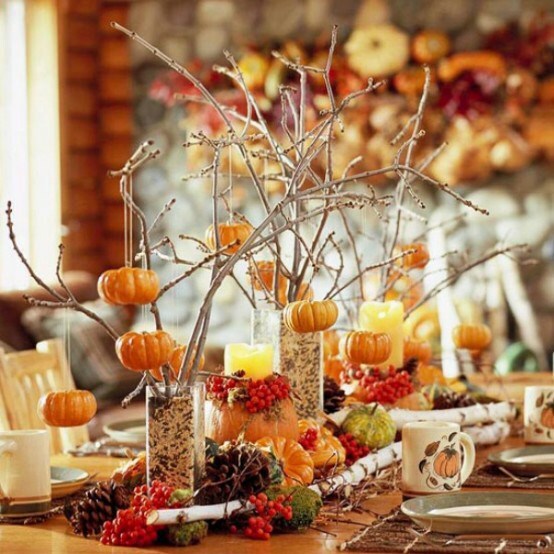 The pumpkin ornaments on a twig centerpiece add some whimsy. Find out more at Zen of Zada. 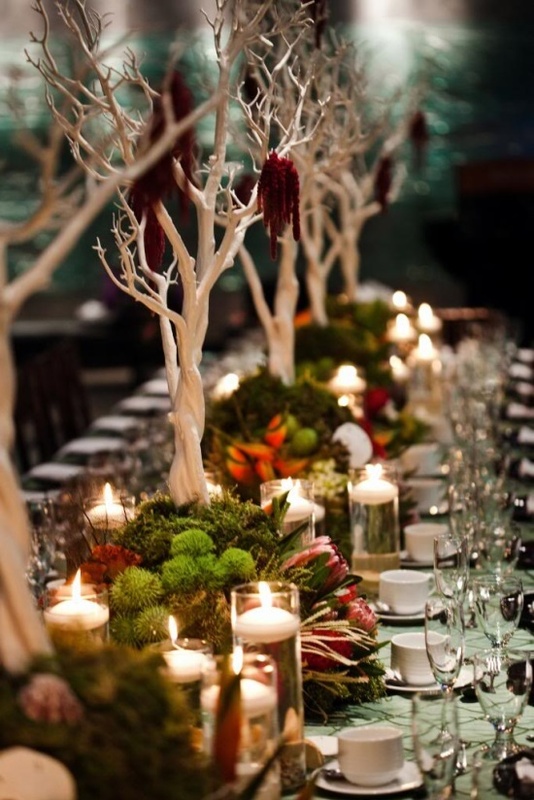 Abandon the vase and lay your decor right on the table for a modern centerpiece. Learn more at Martha Stewart. 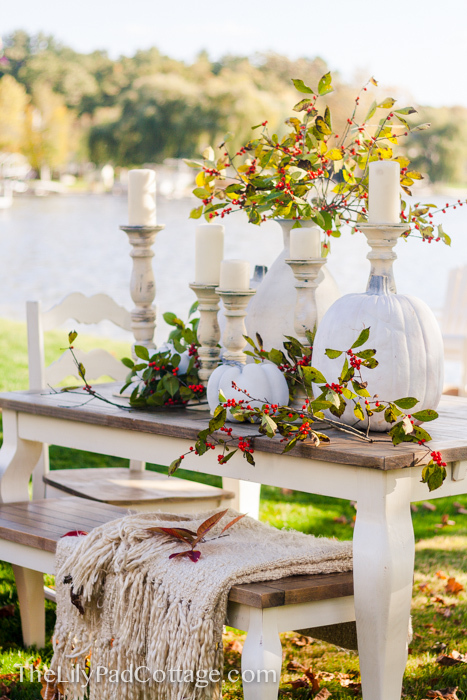 We love the mixture of white pumpkins and bright branches at Lily Pad Cottage. Recycle old bottles into charming vases this Thanksgiving. Find out more at Decorating Your Small Space. 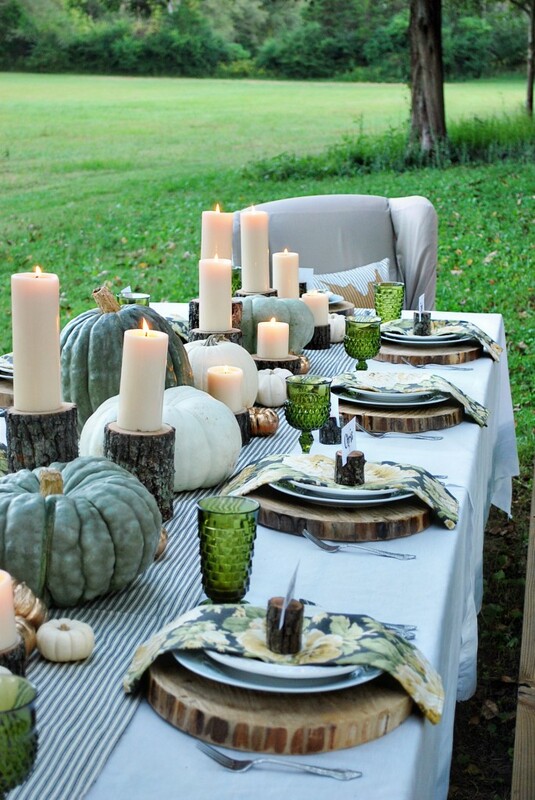 Those green pumpkins can look a little funky at the patch, but make for a lovely Thanksgiving centerpiece. Find out more at Decorating Your Small Space. There’s nothing like lovely candlight to set a cozy mood for Thanksgiving dinner. Find out more at Decorating Your Small Space. 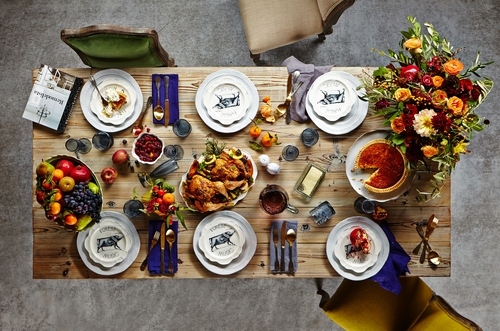 Adore the wood-slab natural tree-truk theme of this Thanksgiving table from The White Buffalo Styling Co.
Make these sweet paper book pumpkins for a unique tablescape. Find out how at Upcycled Treasures. 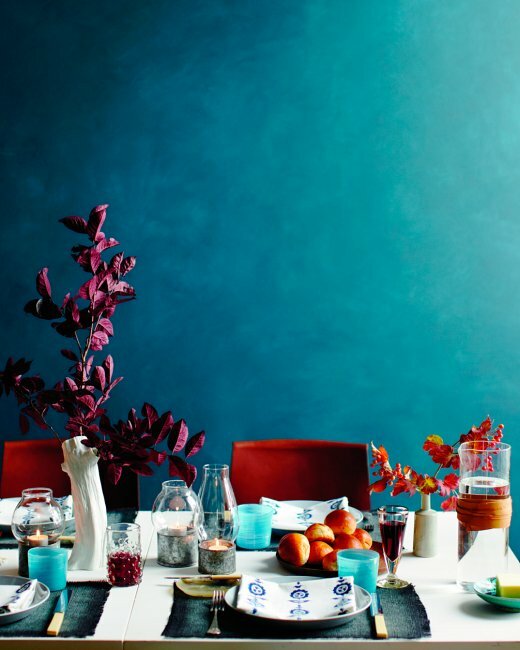 We still love jewel tones for Thanksgiving, especially contrasted with bright white. Find out more at Vicky Barone. 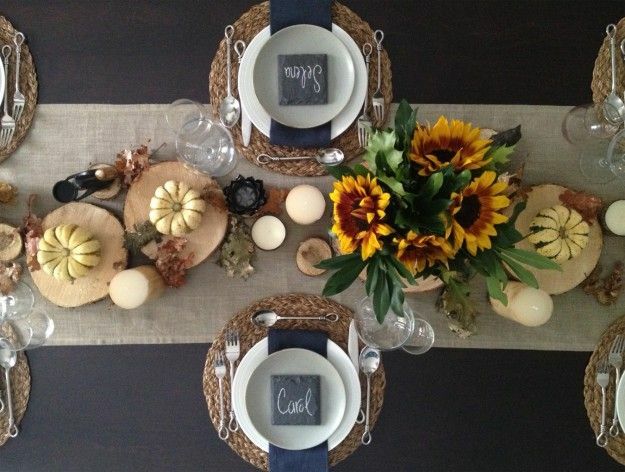 Using simple slate coasters as placecards is a fun trick for making this Thanksgiving table. Find out more at nyla free designs. 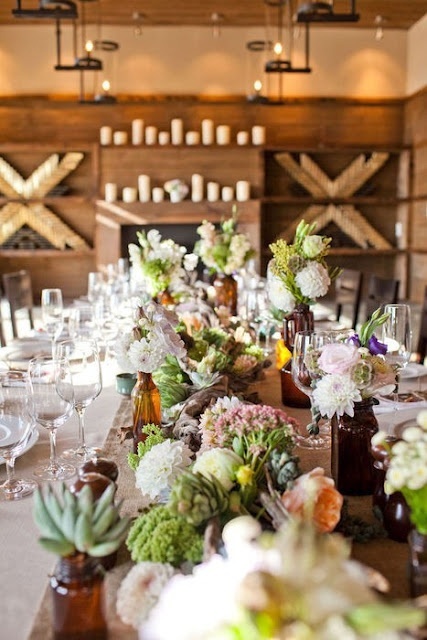 These beautiful custom plates and all white tablescape are surprising and modern, while still traditional. Learn more at TomKat Studio. 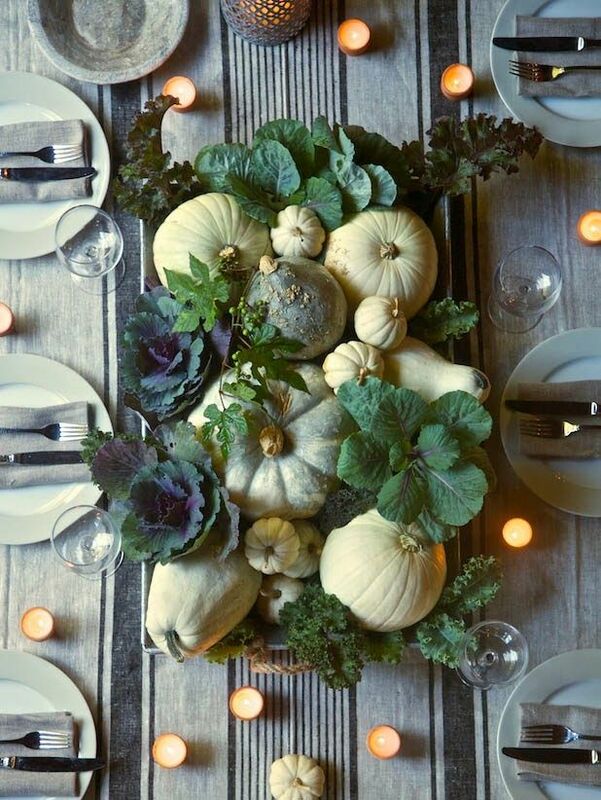 This stunning centerpiece made from seasonal greens and pumpkins is breathtaking. Learn more at Design Chic.